Daylight fireball over Norway on Jan 15th! A bright light flash appeared in the Norwegian daylight skies on Sunday, January 15th, 2017, at about 12h 48min UT (13h 48min local time). An impressive event which was followed, according to witnesses (located from Eastern to Western regions of the country), by a sonic boom which was similar to thunder, a few minutes after the fireball was observed. 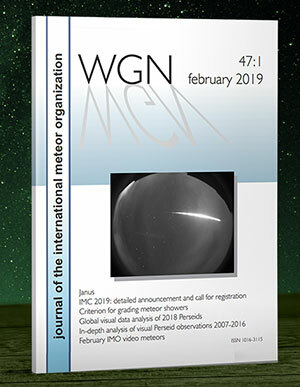 All those elements tend to confirm the highly probable meteoric origin of the event, which was apparently not recorded by the video stations of the Norwegian Meteor Network, even if some work is being made to try to see if it was observed. The meteor network operate numerous cameras, some of which are located in the Lunner, Gran (North of Lunner) and Oslo (South of Lunner) counties. Observations have been received from the regional districts Sogn og Fjordane, Møre og Romsdal, Oppland and Rogaland. The most distant observations are from the city Haugesund in Western Norway and Lunner county some 50-60 km North of Oslo. 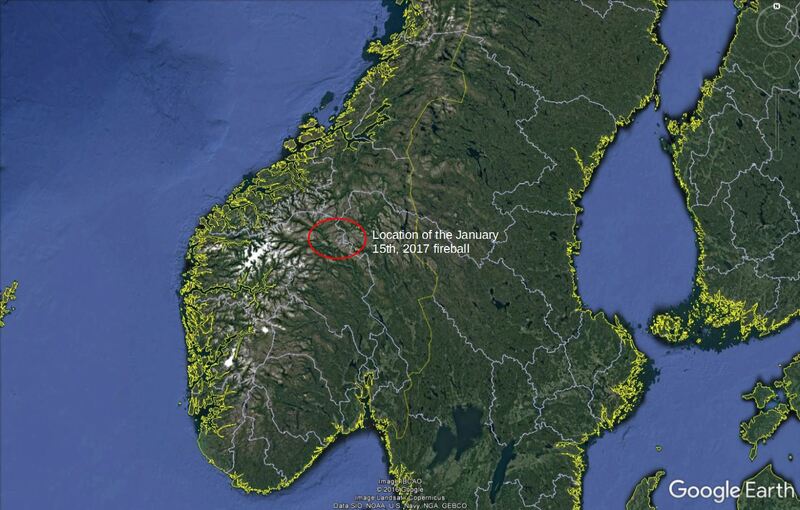 Very preliminary analysis tend to indicate that the end of the fireball was located above the Northern parts of Langfjella, the mountain range that longitudinally divides the country, with highest probability above the Dovre moutain area. Preliminary location of the fireball according to the few comments and reports received so far. But more information are needed to be able to define the accurate atmospheric trajectory and all the physical parameters of the meteoroid that gave birth to this event. This is the only way astronomers will be able to determine its orbit, and thus the regions of the Solar system from which it originates. And to try to evaluate the landing area of potential meteorites that could have survived the meteoroid atmospheric entry. So if you observed this fireball, please do not hesitate to fill in the IMO/AMS Fireball Report Form. 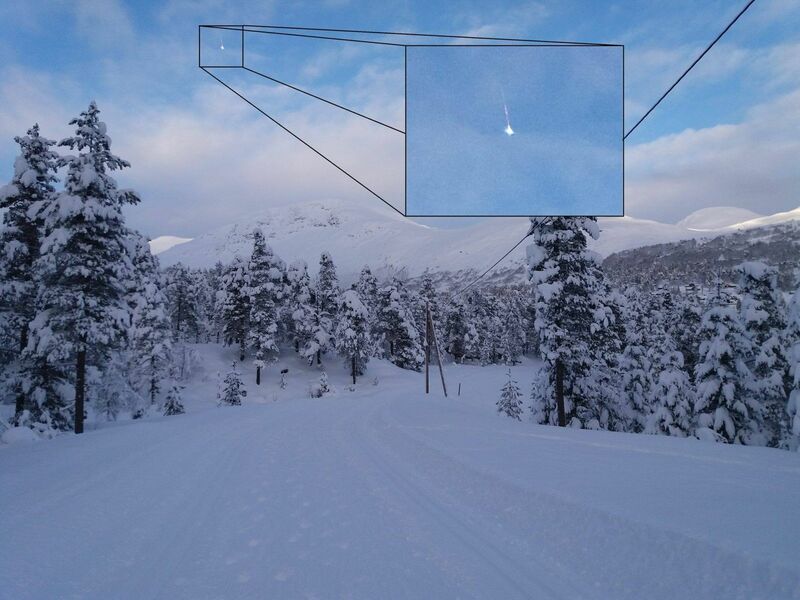 UPDATE (20/01/2017) : a picture of the fireball was taken by Josip Kardanovic, from Stryn, in Norway ! My webcam (http://www.lysefjordcam.com) captured some images of something i’m not sure of what is. Could this be meteors or just planes? I’ve made the images available if someone like to take a look and tell me what they think it is. All images are from Sunday the 15th. 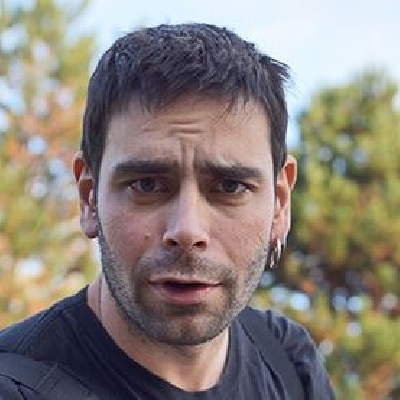 Thanks a lot for sharing your images, but unfortunately, the objects you captured with your webcam are airplanes contrails. But again, thanks a lot for taking the time to check and share your images! Clear skies to you, and best wishes! Thank you Karl for clearing that up.